Foiled and frustrated by a Jeep that hasn’t wanted to start all weekend, I decided to settle down for a smoke this fine Sunday afternoon. Besides, it’s time for a review and a cigar is just the medicine I need to calm the mind, soothe the spirit, and fire up some problem-solving synapses. 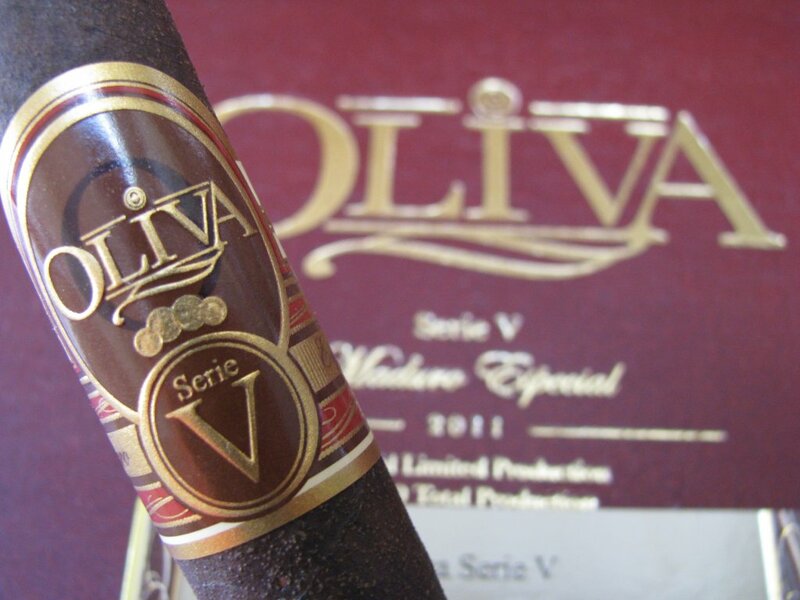 This week, let’s take a look at the Oliva Serie V Maduro. I picked up a 10 count box and a half of these back in December, and have smoked 7 of them so far. These cigars have made their annual appearance on retailers’ shelves since 2008, in limited quantities of 30,000-50,000 sticks. They typically sell briskly, but you can still find them even now in mid January (if you want some and have trouble finding them, send me an email at [email protected] and I can line you up with my local B&M, who still has them in stock as of today). They retail in the Tampa area for about $8.50/single or $8/each in boxes of 10. In previous years, they have been blended and rolled as torpedoes, but come in a toro (6X50) for 2011. The wrapper is a San Andres (Mexico) maduro, and both binder and filler is Nicaraguan. Before first light, today’s cigar reveals an intensely toothy wrapper. It is firm to the touch, with no noticeable soft spots. There are several small tears in the wrapper, although none penetrate the binder. These should not affect the smoking, but it is worth mentioning. On each of the ones I have had thus far, the first few puffs have provided a good dose of typical Nicaraguan spice. This spice, however, is tamed by a slight sweetness in the background upon retrohale. If you prefer one or the other, you can control the two by metering how much fresh air is drawn in during your puff. 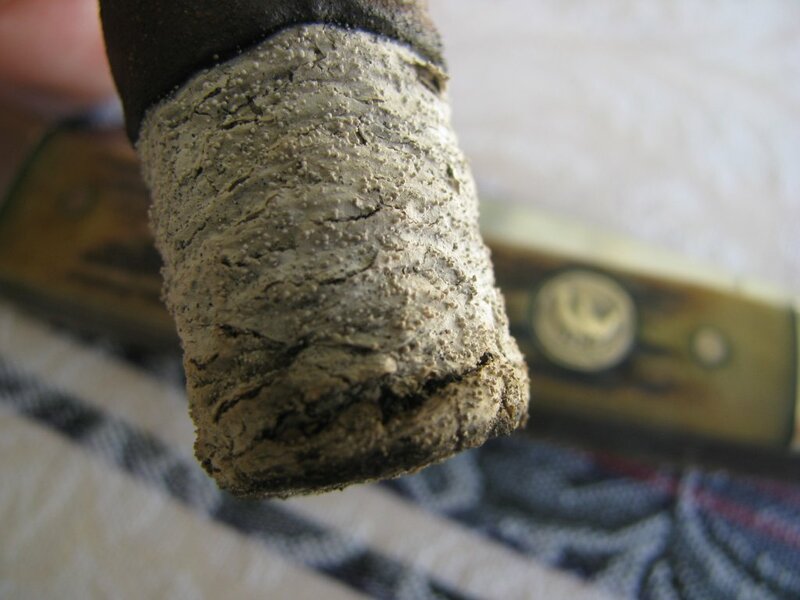 If you leave the corners of your mouth open while drawing, you can pull in fresh air with the smoke – the more fresh air, the more prevalent the sweetness in this cigar, and vice versa. More fresh air in the mix will also dilute the drawn smoke and reduce the burn when exhaled through the nose. 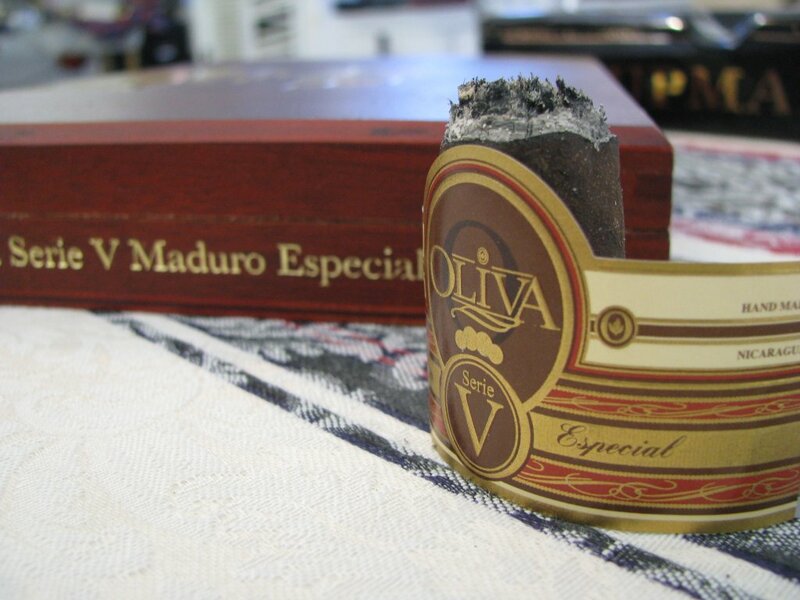 This cigar also produces a smoke which is quite dry on the palate. The volume of smoke generated is impressive, as well. It will continue to burn and produce a great deal even after being placed in the ashtray for a bit. 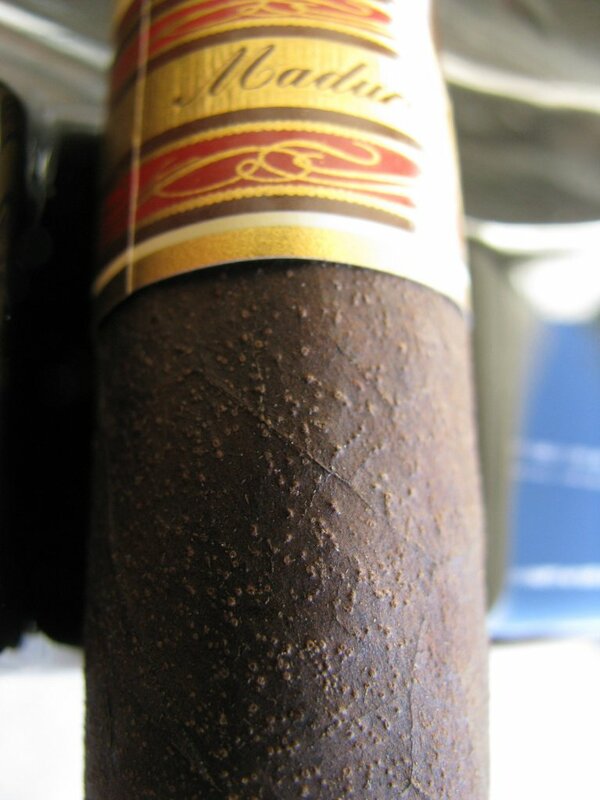 In this first inch of smoking, the flavor is akin to cocoa, although with a slight (but pleasant) bitterness – think dark rather than milk chocolate. 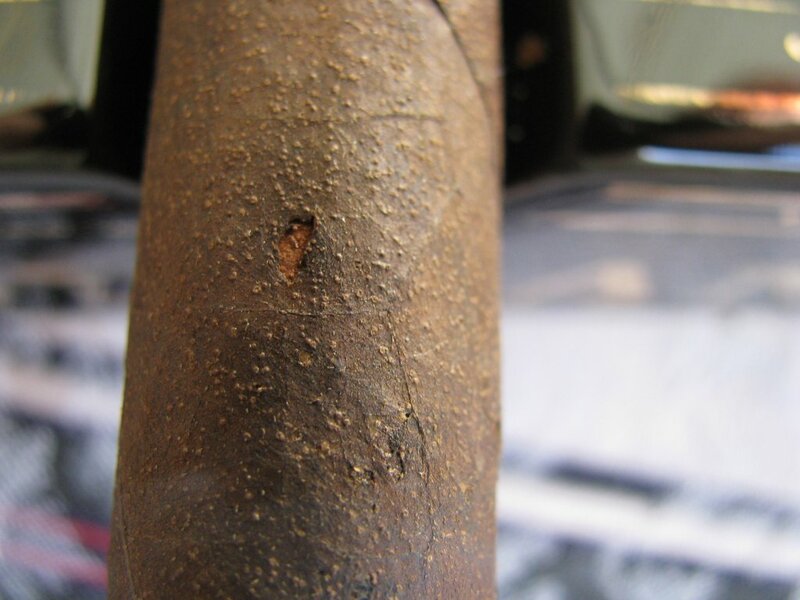 The ash is mostly white, and yields such fine detail that it still shows the tooth of the wrapper leaf. I’m not one to make claims about any qualities of a cigar based on ash color (I’ll leave that to Sherlock Holmes), but this one is certainly nice to look at. The ash held on to just past an inch before breaking off. 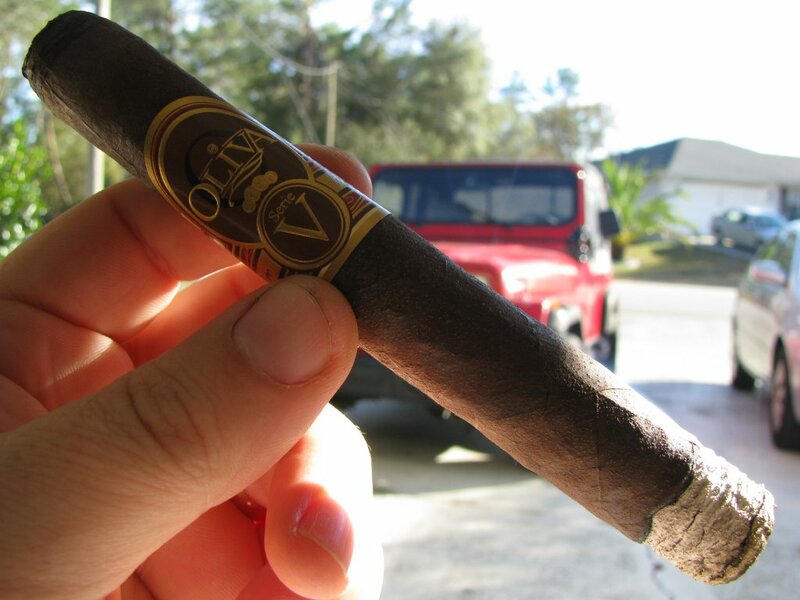 A little further into the smoke, it occurs to me that each example of the 2011 Serie V Maduro I’ve had has tended to burn very slowly, and responds well to a slow cadence when smoking them. I had some burn and draw issues with the 2010 release, but I have to say all the ones from this release have been outstanding. The burn line has been razor-sharp, with very little wandering. I haven’t made so much as a touchup on today’s stick, and don’t remember ever needing a relight on the others from this release. As I’ve mentioned before, having to fidget around and relight a cigar is a serious pet peeve of mine. This one has been absolutely worry-free, as have the others. Over the course of seven sticks, that impresses me considerably. Each of mine from this batch have been impeccably rolled. I’ve had none of the burn issues I remember from last year. Rounding out the second inch and into the third, the flavors remain very similar to those in the first portion of the cigar. While this has changed little throughout the stick, the flavors are pleasant enough to stand on their own and not become tiresome. Much of the spice has subsided, although that might actually be due to my becoming desensitized to it. It was never overpowering in any event. The dark chocolate and mocha/coffee flavor still remains firmly in the front seat, although more sweet notes begin to make themselves known. At the three-inch point, there is an occasional but distinct hint of molasses as well, although this is fleeting and sporadic. The dryness of the smoke is worth mentioning again, as I am halfway through this cigar and the area around the clipped cap is still almost completely dry. It produces almost no reaction from the salivary glands. I sometimes tend to be a wet smoker, yet even with a glass of water at hand this stick stayed dry. In the final stretch of smoking, the flavor did become slightly “ashy” for a couple of minutes. I’m glad I stuck with it, though, because that subsided and was replaced by a return of the earlier sweetness. In fact, this was actually one of the more enjoyable portions of this cigar. The burn remained true all the way to the nub, and I never even felt compelled to touch it up. Overall, the 2011 Oliva Serie V Maduro is a very impressive cigar. The construction and draw are flawless, and the appearance is beautiful. Because of the almost monochromatic flavor profile, I would not likely place this in my day-to-day smoking rotation; however, it is a great stick to keep around for the occasional treat, and well worth putting away a box (or two) for the year ahead. The availability is limited enough that the market will never be flooded, yet obtainable enough to keep you coming back for more. I think it fits well within the niche for which it is made. So, if you have the chance, I definitely recommend putting a few away for a rainy day. Love the review. Just purchased one myself and am excited to try it. I am interested in your note about how the cigar was dry and didn’t get your saliva glands working. Also, I am the same why and hate cigars which have crooked burns. Logan…I’ve heard that how dry/wet your mouth is during a smoke is related to the pH of the smoke itself – wetter=more acidic/dryer=more alkaline. 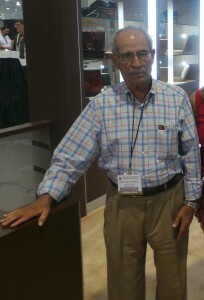 I have absolutely nothing to back that up, though…just overheard in the typical cigar shop chatter. It’d be interesting to know for sure how that works.